Italy - IOM reports today that its Missing Migrants Project has totaled 4,027 migrant or refugee deaths thus far in 2016. At this point last year, Missing Migrants Project tallied 2,991 – which means that already in 2016 the world has witnessed over 1,000 more fatalities than occurred through 2015’s first seven months. In 2014 IOM reported 2,265 migrant or refugee fatalities through the end of July. Deaths in the Mediterranean this year have reached 3,120, with IOM Libya reporting 120 bodies discovered on the beaches of Sabratha late last month. More than three-quarters of migrant deaths recorded thus far in 2016 have occurred in the Mediterranean, compared with 60 percent during the period of January through August 2015. In Europe, IOM’s Missing Migrants Project has recorded 26 deaths during migration on land in 2016, slightly lower than the 31 recorded from January-July last year. However, the number of deaths during migration in Europe during the first seven months of both 2015 and 2016 are significantly higher than the 9 deaths recorded in 2014, indicating that current policies may be increasing the risks migrants and asylum seekers face on their journeys. In North Africa, IOM reports 342 deaths during migration on land in 2016, over three times the number recorded in the same period in 2015. IOM data indicate an increase of migrant deaths due to violence by both smugglers and local authorities in North Africa. At least 30 migrants died due to violence this year, compared only three in the first seven months of 2015. IOM reports 81 migrant deaths on land this year in the Middle East, compared with just two last year. Of these, 64 were of Syrian asylum seekers, reportedly shot by Turkish border guards. IOM’s Missing Migrants Project cites reports from Human Rights Watch and the Syrian Observatory for Human Rights for these data. IOM reports that 257,186 migrants and refugees entered Europe by sea in 2016 through 27 July, arriving mostly in Greece and Italy, where over 24,000 new arrivals entered during the month of July. For the third straight year IOM will report migration fatalities of at least 3,000 men, women and children on these dangerous sea routes. IOM Rome spokesperson Flavio Di Giacomo reported today 7,923 migrants were rescued at sea between Friday July 29 and Monday 1 August. He said that on Friday 3,621 people were rescued; on Saturday 1,144; on Sunday 1,188; and on Monday 1,970. Some of those rescued are still on their way to Italy. Rescue operations were carried out by the Italian Navy, the Italian coastguard, ships operating under Triton and Eunavfor Med, and by the private ships Topaz Responder, (MOAS), Aquarius (SOS Mediterranée) and Dignity 1 (MSF). Di Giacomo explained that even counting those rescued this past weekend, arrivals registered this year in Italy are virtually identical to those registered last year – 94,449 arrivals compared with 93,540 – a difference of around 1 percent. Through 1 August, arrivals to Italy now total approximately 96,000. Kelly Namia of IOM Athens reports 118 arrivals by sea were registered on 29 July, and 6 arrivals on 30 July. 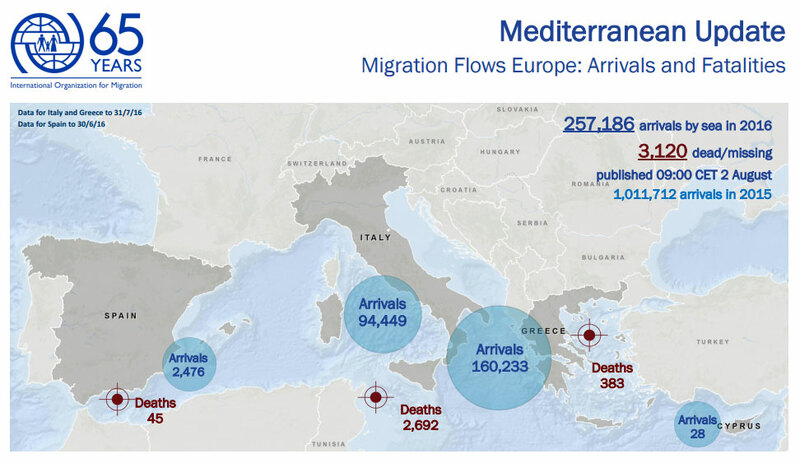 Total arrivals in Greece through 31 July are 160,233.